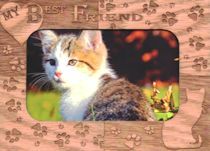 This magnetic cat picture frame is made of alder wood and is engraved with the words My Best Friend. The size of the frame is 5" x 7"; displays a picture 3 1/2" x 5". A perfect memory piece for a beloved cat. Because this frame is magnetic it can be placed on any metal surface or it can be inserted into a 5" x 7" frame. Made in the USA.